A young and free-Spirited Tuskan girl with a tragic past. Mirette was born with the Key Spirit, Jumamis, already inside her body. As such Mirette was dubbed the 'savior' of Tusk. Since the day of her birth, she has been isolated and confined to a small tower above the Tusk Palace, where she can be kept 'safe'. Though she has been visited by all of the four ministers, it is Gitra that is her primary guardian. She enjoys listening to the music that Gitra plays on a large pipe organ that she can hear from her room. Later, after expressing a desire to see a real sky, Morima gives her two 'move shards' that allows her to escape the castle. She explored the area around her, wide-eyed at all the things she has heard of, but never seen. She eventually encountered a man named Doruga, who showed her the insides of Tote's Cave, which resembles a night sky. Mirette was eventually found by Tusk soldiers in Gitra's care, but escapes again where she runs into Zed, who had just arrived in Tusk. 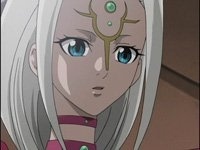 When Zed returns and reveals that he not only failed to get the other key Spirits, but also lost his own,Mirette decides to return to the palace. She feels that Zed's failure is a sign that she can't escape her 'destiny'. Zed has a private moment with her and gets her to confess that she truly doesn't want to be a 'savior', but she also doesn't want to run anymore. Zed asks her to let him take her burden, but she runs off before giving him an answer. Wanting to see Doruga and the 'stars' again, she returns to Tote's Cave and finds Lord Doruga there. She is at first happy, but her joy then turns to horror as Dolga demands she give him her key Spirit. Zed and Gitra arrive, but then Xeem and several squads of Tusk soldiers also arrive. As a battle prepares to begin, Mirette's sorrow and shock at what's happening causes her own key Spirit, Jumamis, to awaken and emerge. The Spirit then draws all the other key shards to it and the shards revolve around in the air. Then all six key shards descend and enter Mirette's body. As the others look on, Mirette is surrounded by a black haze and a massive black Spirit, with long gray wings covering its face, appears. Xeem says that the Spirit is the true form of the combined key Spirits, Tasker. Although, Mirette was unable to handle the resurrection of Tasker. When the key Spirits left her body and went to Noa, she woke up without her memories. Gitra becomes her caregiver, taking her on a journey to see the world.